One of the first things I did when we moved into our new house was organize our kitchen pantry. I have found that if my pantry is neat and organized, it is easier to keep the rest of the kitchen organized as well. 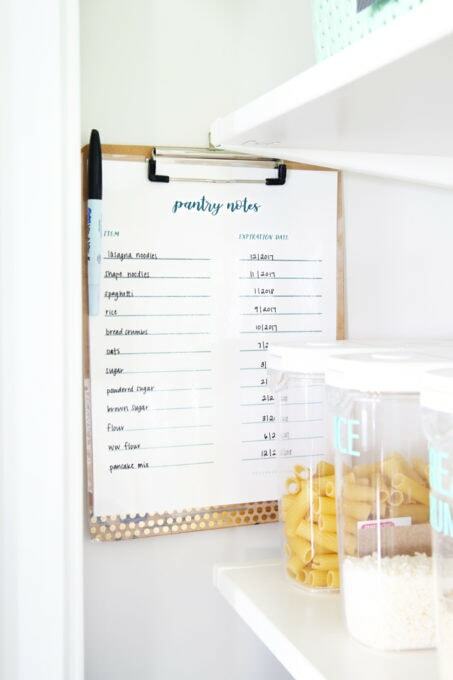 Because of this, I knew I needed to make sure I had a system that allowed me to keep our pantry looking beautiful and organized for the long term, not just for a day or a week. Whether it’s the type of shelves or configuration of them, having a functional shelving system can be a huge help in creating and maintaining an organized pantry. When we first moved in, our pantry had wire shelves, which can totally work in some situations, but presented some challenges for us. While we had the shelves out, we also decided to install some beautiful removable wallpaper in the back of the pantry for a nice pop of pattern whenever we open the doors– little details always make me smile! Pantries typically need to hold a whole bunch of stuff. The challenge is being able to store everything you need in a way that makes it easy to find exactly what you’re looking for. To solve this issue, I decided to use inexpensive plastic baskets to separate my pantry “stuff” into categories. Not only can I now find my items easily, but everyone in the house can clearly see where each type of item goes so things end up back in their spot, which allows us to maintain our organizational systems long term! We have bins for the boys’ school snacks (one for sweet and one for salty! ), a bin for seasonings, one for baking items, one for boxes and canned goods, and even a “miscellaneous” bin that acts as a catch all for seasonal items or things we don’t keep around all the time. The baskets are from Target, and they come in a bunch of different sizes. They have different colors for each season, so you could probably find some to match the colors of your house without too much trouble at all! I admit, I am a smidge obsessed with labeling! In our pantry I took simple gift tags and used my Silhouette machine to cut out little labels from adhesive vinyl. You could also use a label maker (I have this one! ), create labels in Microsoft Word or Canva, or simply hand write your labels! I also used adhesive vinyl letters to label the containers that hold our baking supplies and pasta and our spice jars as well. I laminated the printable (My laminator is similar to this one.) and used a dry erase marker to write the item and expiration date on the lines. This makes it really easy to change out items and dates as we go through the ingredients in our pantry. I couldn’t just keep this pretty printable to myself though! You can snag it for your own pantry below! 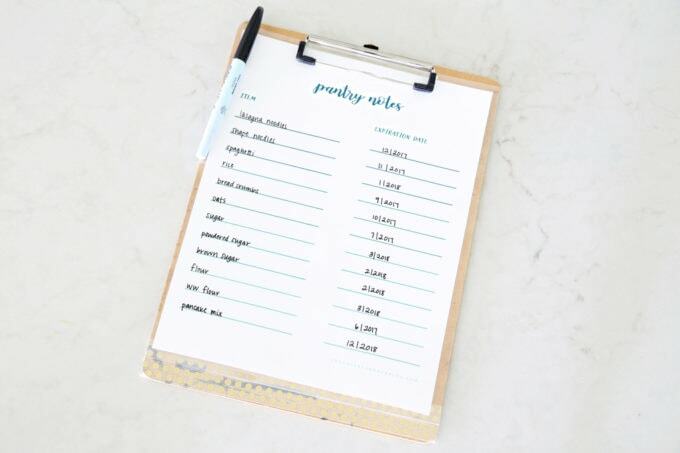 Click here to download the Pantry Notes printable! I love risers because they are super inexpensive and can help make a space so much more functional! They work like a charm for our spice jars. I can easily see what’s in each one and they don’t take up much space in the pantry. In my last pantry, I also used the risers for canned goods and it worked well for those too! Before I wrap up, I also wanted to mention this fun storage hack that I discovered recently! Our water bottles were always messy and falling over; they were also on a high shelf that was hard for Donnie and I to reach and impossible for the Cs to get to. I had seen the idea of using a wine rack to hold water bottles in a few different places, so I decided to try it in our pantry, and I love it! Each bottle sits neatly in its own spot, the lids always stay with their designated bottle, and the Cs can easily grab one and fill it up any time they’re thirsty! Now if you’re in a kitchen that’s really crunched for storage space, this may not be the best option because it’s not the most compact configuration, but if you have a little bit of room to spare, I have really loved this system. 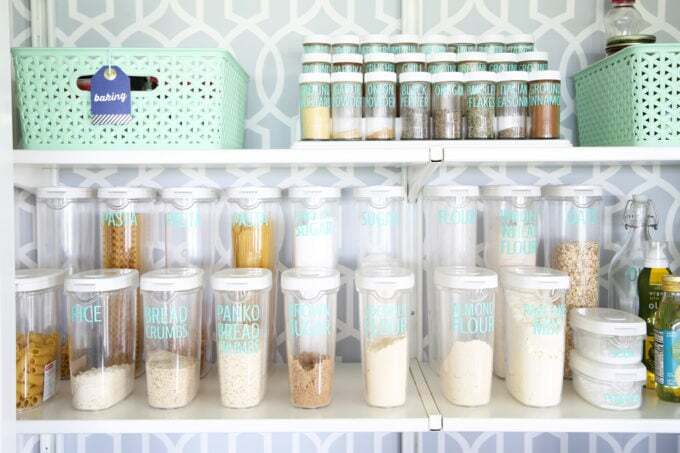 Pantries can feel overwhelming to try to organize, but they don’t have to be! 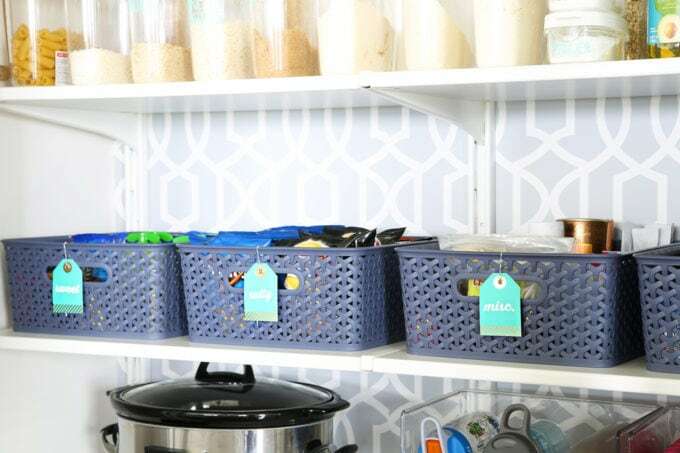 These 5 simple tips have been huge for helping me to create and maintain a beautifully organized pantry, and I hope they will be helpful for you too! If you have any questions about where I found any of the items I mentioned in the post, I am including a full source list below. Your pantry looks almost too perfect to cook out of! 🙂 Love the organization AND how pretty it is to open. Did you make the ‘Lawson & Co.’ sign? Super cute! Thank you, Brittany! You are so sweet! I did make the sign! It was originally for our old kitchen, but I thought it worked well over the pantry in this kitchen too. 🙂 Hope you’re having a wonderful week! Ahhh! You just solved one of my biggest kitchen frustrations. The water bottle wine rack tip is going to change my life! I gave up and started tossing them in a drawer, which is a mess. I cannot wait to get them organized and keep the kid bottles separate from the adult bottles. Thank you Abby! Who knew that water bottles could be such a huge pain?! Mine were killing me until I found this tip! 🙂 Hope you are having a great week, my friend!! Yay! Glad it will work for you, too! It’s been such a great solution for us! Have a wonderful week, Lynn! Wow! I love this! Can not wait to start on mine…one day! We are in a camper, finishing up our cabin, where I will have a nice big pantry. I can not wait! Thanks so much for this. 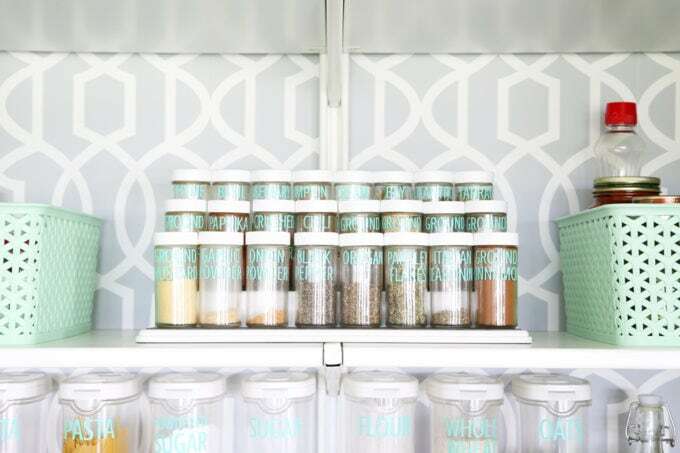 I think I am going to grab some of those spice jars so I can create a spice drawer in the camper! Ooh love the spice drawer idea! Thanks so much for your sweet words, Amy!! Pinning page ASAP, I’ll be needing it someday… Thanks! Aw, thanks! Have a great day! I love the way you use your silhouette!! the labels on the spices’ containers are gorgeous!!! Thanks so much, Silvia! Definitely love my labels! 🙂 Hope you’re having a wonderful week! Oh my! You are so neat and organized!! 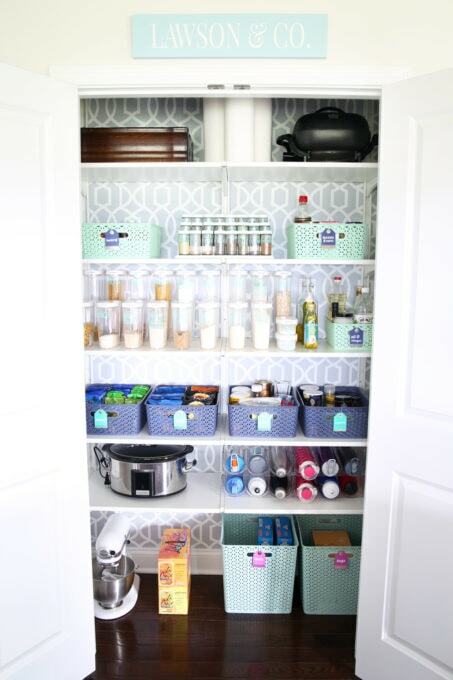 I wish I had a pantry to organize, but I may be able to apply some of these ideas to my little cabinet “pantry”. 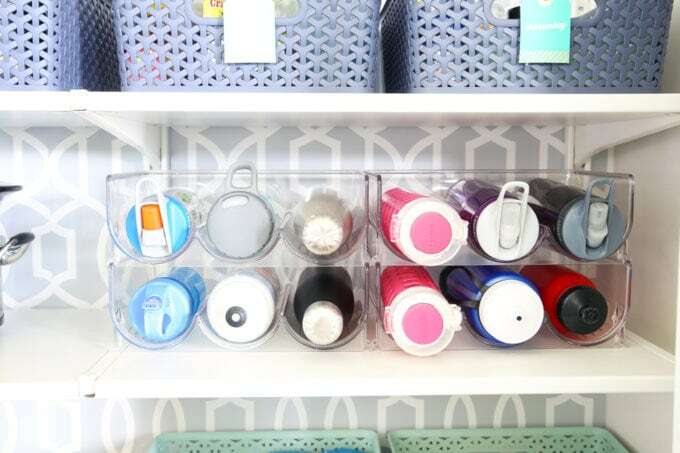 I love the clear organizers you choose and keeping everything uniformed really looks so neat and clean. Thanks for sharing! Did the shelves from IKEA fit perfectly in your pantry? What size did you buy? Hi, Diana! In true IKEA fashion, when you go to the store, all of the pieces are sold individually, not in arrangements like they show online. So for the pantry we used 3 uprights, 10 shelves, and 15 brackets. 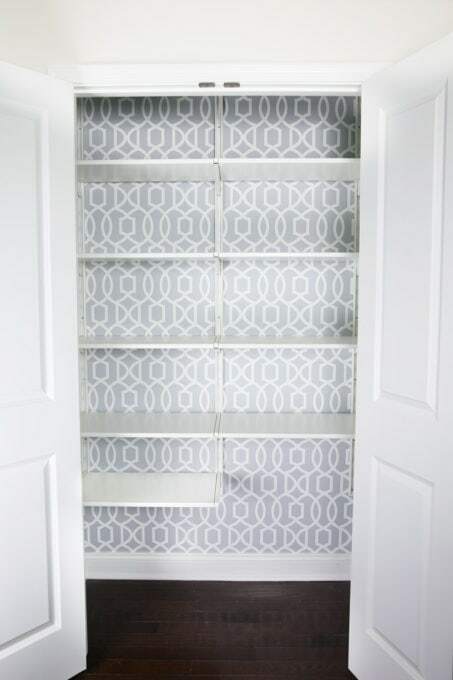 I go into detail about how to measure and select pieces for your ALGOT closet in this post: https://justagirlandherblog.com/ikea-algot-closet-system/ . I hope this helps! Loved the idea of using a wine rack as a water storage holder. 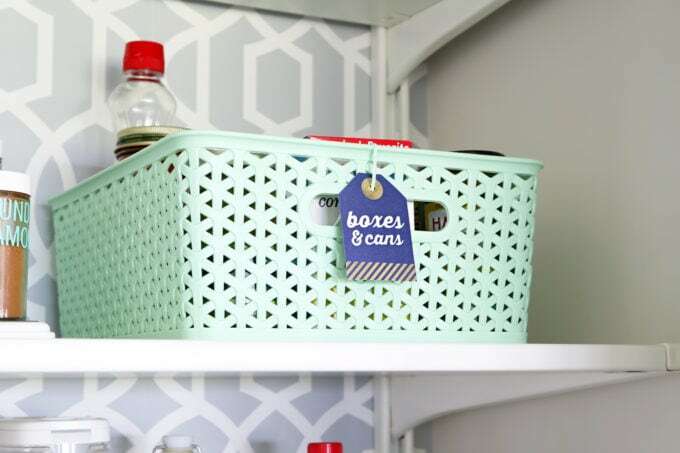 You’ve done some amazing things organising your home! Thanks, Kevin! The wine rack has worked great for us! Have a great weekend! your pantry is spectacular!! For the IKEA ALGOT system, there are so many to choose from, which one did you use in your pantry? Hi, Daphney! In true IKEA fashion, when you go to the store, all of the pieces are sold individually, not in arrangements like they show online. So for the pantry we used 3 uprights, 10 shelves, and 15 brackets. 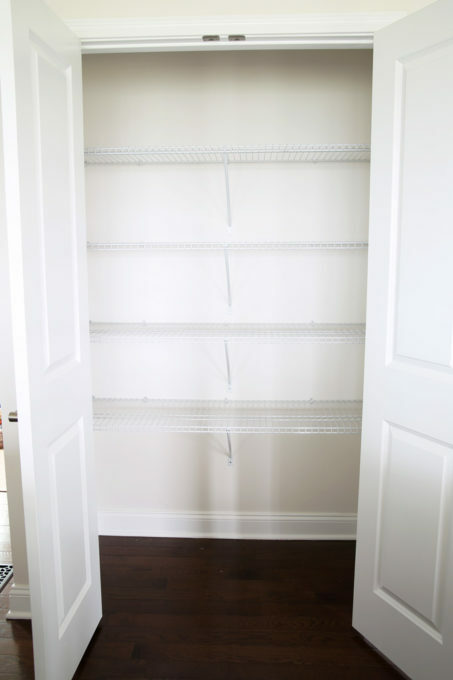 I go into detail about how to measure and select pieces for your ALGOT closet in this post: https://justagirlandherblog.com/ikea-algot-closet-system/ . I hope this helps! I definitely need to get my hands on those uniform containers. My dad was looking for something on the pantry the other day and he accidentally dropped an open bag of lentils. There were lentils all over the place haha That wouldn’t have happened with one of those containers and they also make everything look so much prettier! Thanks for making me want to be more organized! Aw, so glad it was helpful for you, Lucia! Those lentils can be tricky! 🙂 haha Have a wonderful weekend! Today I am tackling the bedroom closet! I rent from my parents, and my bedroom closet is also family storage space, so I need to purge some things and find a new system to make it all work in there. It has worked SO well for us! Hope it’s a great solution for you, as well! Thanks for stopping by… have a great week! I love your pantry! And I especially love how you use attractive bins to keep your canned goods both hidden and orsgnized. Every time I organize my own pantry it seems it is in disarray again after a week. 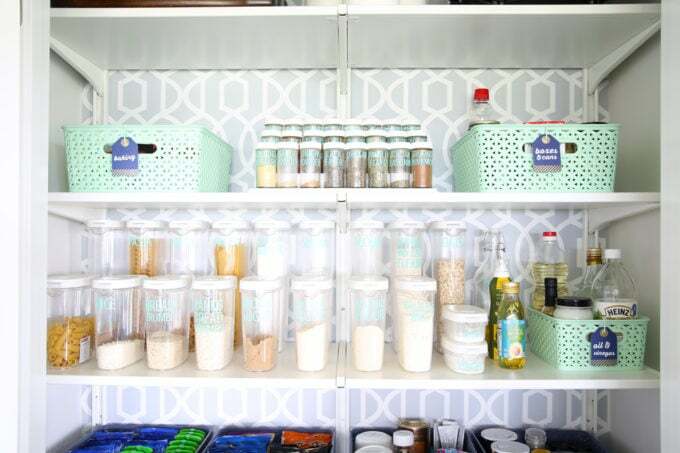 Definitely planning to redo my pantry now! Thank you! Great tips Abby! You’ve given me some good ideas, thank you! Where did you get those fantastic labels? Hi, Louise! I make them with my Silhouette! It is linked at the bottom of the post. 🙂 Thanks for stopping by! Hi, Shannon! We’ve used the ALGOT system in 6 closets now, and we always do the 15 inch depth so we have more room to reach in and grab what we need. It has worked really well for us! YES! It is my favorite! 🙂 Love the idea of using it on bookcases! Have a great weekend, Stephanie!